You will have an amazing experience! We meet at London Heathrow Airport at Midday for transport in our private mini-bus to our self contained accommodation in the heart of the British countryside. OR you can make your own way to the nearest railway station for a pick-up after 3pm. During our first afternoon we will settle into our accommodation, get to know each other and prepare for our evening visit to Stonehenge. As the sun sets over Stonehenge we join together in our ceremony of transformation and healing, within the sacred circle of Stonehenge. 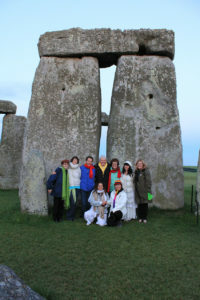 Our group has one hour private access into the inner stone circle of the world's most famous sacred site. In this ceremony we will focus on letting go of the old, reclaiming our power and past life skills, attuning with the Divine Masculine and the Earth Matrix, of which Stonehenge is part. 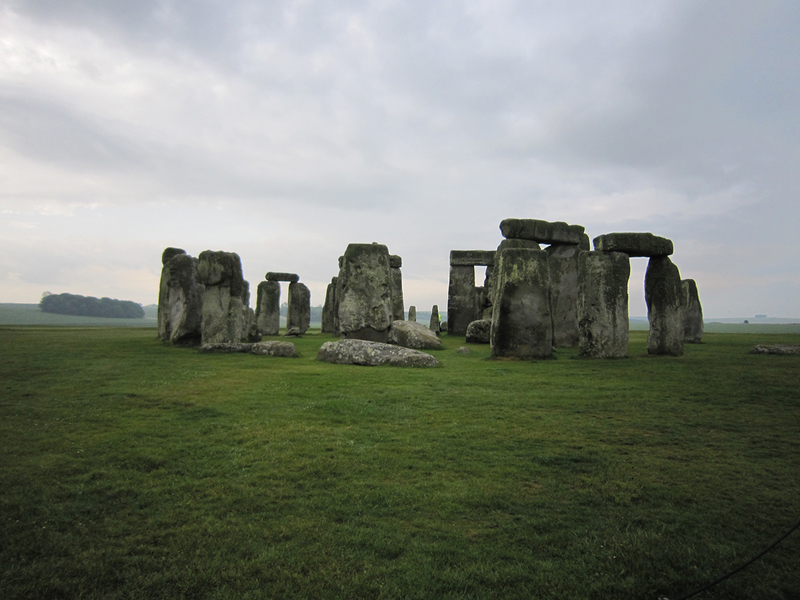 You will be standing amongst the huge megaliths which have stood in magnificent isolation on Salisbury plain for thousands of years. 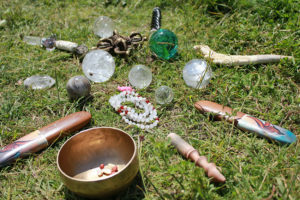 Feeling the powerful earth energy currents which connect to the planetary matrix, you will experience our own unique ceremony, meditating within the sacred stone circle. There will be time for photographs. Avebury is a village which sits right in the middle of a unique megalithic ritual landscape of giant stone circles and avenues. 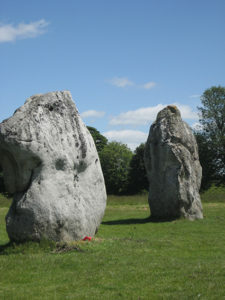 It is the largest stone circle in the world which has an imposing bank and ditch, with inner stone circles. We will wander among them at leisure and attune to their energies. A short way from the great stone circle lies the mysterious pyramid-shaped Silbury Hill, the largest artificial structure in Europe associated with ancient harvest rituals. We may also visit the chambered mound of West Kennet Long Barrow, an ancient underground chamber with powerful acoustics. secrets. The open air market is held in the marketplace, as it has for over a thousand years. Built on an ancient pre-Christian sacred site, the cathedral was established in 705 AD. 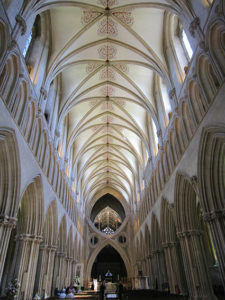 The magnificent 800 year-old Gothic Cathedral occupies the central position in this, England’s smallest city. Next to the cathedral is the Bishop’s Palace complete with its moat, drawbridge and beautiful swans. You may walk the oldest intact medieval street in Europe which is still used to house the young cathedral choristers. 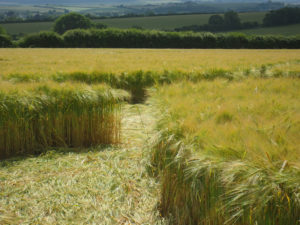 We will head out into the wilds of the British countryside, exploring thatched villages in search of recently created crop circles. We then take a cross country hike to Gog and Magog, two ancient Druid trees, the last remnants of an avenue that lead to the Tor. 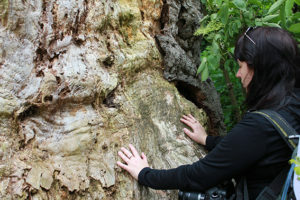 The energy that these ancient trees still hold today is profound. 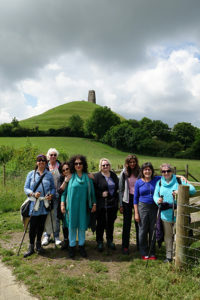 There will also be free time to explore Glastonbury’s many unusual shops and cafes, you may visit the beautiful stillness of the Magdalene Chapel or Glastonbury Abbey, burial place of the legendary King Arthur and Lady Gweneviere. The Abbey is also home of the holy thorn, scion of the one planted by Joseph of Arimathea in AD37. 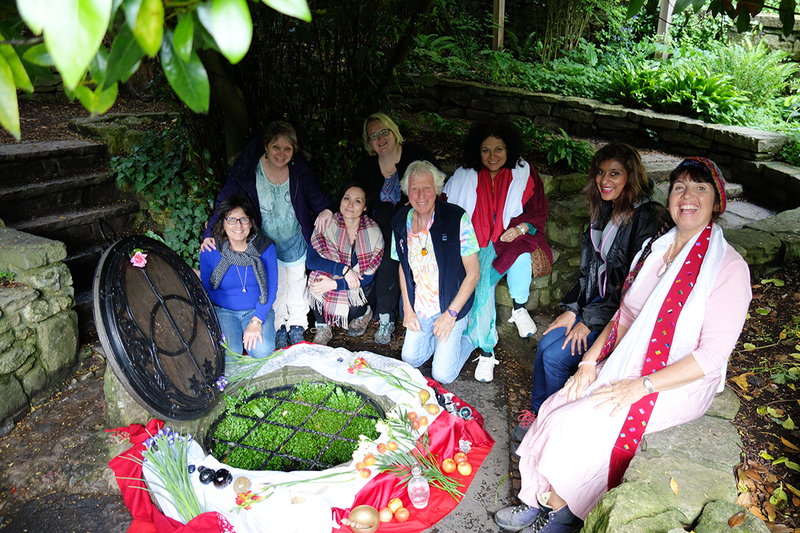 We conclude this day in Glastonbury with our own private time at the Chalice Well (6pm) for meditation and ceremony when we visit the beautiful and tranquil gardens. Considered by many to be the holiest well in England, it is one of the true healing places in Britain. Many believe the Holy Grail is buried there within the wellhead. The Michael and Mary ley lines cross within the Well grounds and we will each stand at their convergence during our ceremony. Chicchan and Raym will lead us in a heart opening ceremony in which we will drink these most potent of waters, both the white and red, focussing on the energies of the Divine Feminine, unconditional love and the waters of life. 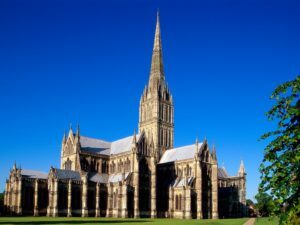 A visit to Salisbury Cathedral with its towering spire. In the Cathedral we will enjoy spectacular views as we explore the roof spaces and tower, climbing 332 steps in easy stages by a narrow winding spiral staircases to reach the foot of the Cathedral spire 225 feet above ground level. We may enjoy refreshments in the Cathedral refectory restaurant afterwards. In this long day trip we drive down to glorious Cornwall to visit the castle ruins of Tintagel, set on an island peninsula amid the rugged Cornish coastline. The castle is the legendary birthplace of King Arthur and is dramatically located on top of a promontory by the sea which is accessed by a footbridge. 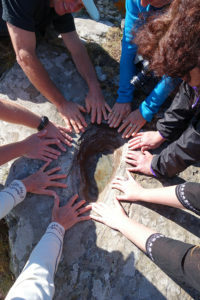 We will each stand in Arthur's footprint, his mythical inauguration place. At low tide, we will descend the castle cliffs to the beach below, entering Merlin’s Cave, an extraordinary portal to the Otherworld. Tintagel High Street has cafes and gift shops to tempt us before we drive on for a wander through the magical fairy woods of St. Nectan’s Glen with its waterfall and kieve (initiation bowl). The walk follows the woodland stream via a Celtic chapel and holy well, to arrive at its famous waterfall shrine where, on a previous visit, we encountered and photographed many mysterious orbs. 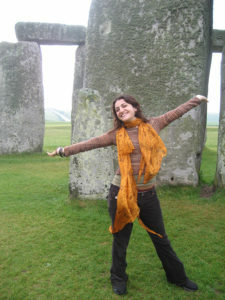 the free walking tours of Bath and have personal time to explore this exquisite ancient Roman town. Bath is built around hot thermal springs which were revered in Pagan times and later enclosed by the Romans into their bath houses and temples. You may take a tour of the Ancient Roman baths and museum or personally experience the modern baths at the Thermae Bath Spa (recommended), an optional choice during your free time in Bath. Book your spa time or treatment early and bring your bathers! You will be free to explore the elegant streets with their 18th century architecture, leafy Victorian parks and fine shops or have lunch at one of the many fine restaurants or in one of Bath’s eclectic cafes, at your own discretion. 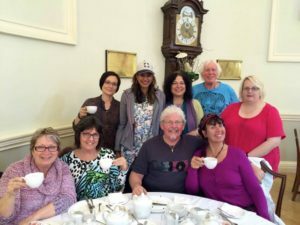 We will meet for high tea in the famous pump room which has been operating continuously as a meeting place for over 200 years. 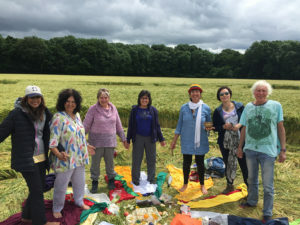 Our final midday Solstice ceremony either on top of Silbury Hill or in a Crop Circle will focus on Divine Union, connection to All There Is and Oneness via the cosmic matrix, followed by integration, rest and celebration! Pack up and return to Heathrow airport by Midday. This nine day itinerary is flexible, due to the unpredictable nature of crop circle formations, which we will visit as they occur. 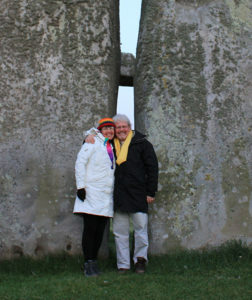 We will create three ceremonies on our tour; inside Stonehenge, at the Chalice Well wellhead and in a recent Crop Circle or ancient sacred place. We will arrive with ideas for the group and welcome your input. You may wish to bring a special crystal to carry or wear during the ceremonies, we are happy to advise you. Crystal Dreaming™ practitioners should contact Raym for advice on kits and crystals prior to departure. Because of its distance from the equator, UK summer days are long with sunrise at around 4.30 am and sunset around 9.30 pm. 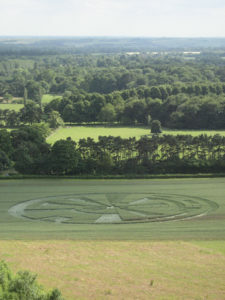 All planned days are subject to last minute change due to unpredictable nature of crop circle appearances. We will be based in one location and will travel from there each day in our own private minibus. The tour price includes all transfers, accommodation, breakfasts and evening vegetarian meals prepared by the group, in our own accommodation. Lunches may be prepared and carried by each individual from our supplies, snacks are carried on our tour bus. This is a small self contained tour group of up to twelve people, spaces are limited and the tour fills quickly. The weather in the UK can be unpredictable. Temperatures may average around 20-25C (66-77F) during the day and it can become cool in the evenings. Being an Island next to cold ocean currents it can also be unpredictably wet, so please carry a lightweight waterproof at all times. 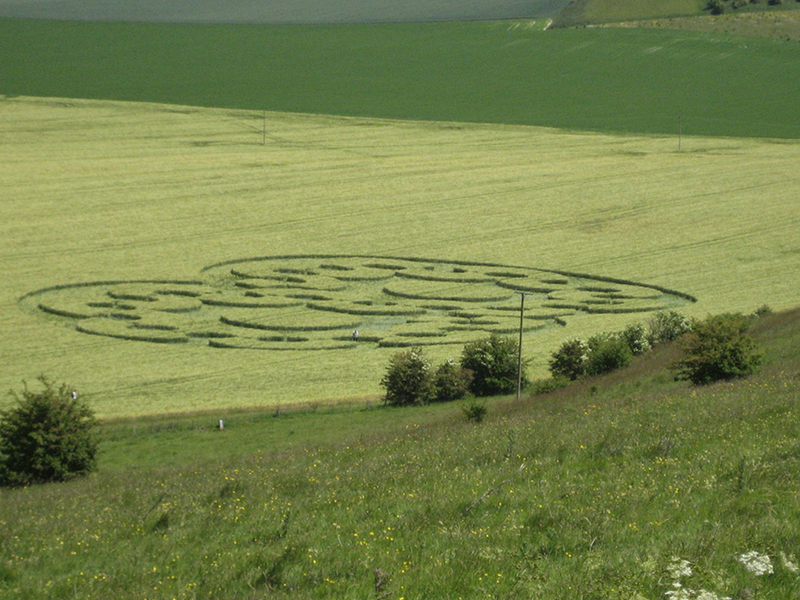 We also recommend comfortable walking shoes or hiking boots as crop circles are not always easy to access. St Nectan’s Glen is accessed by a winding muddy track and Silbury hill is steep and the track is narrow, uneven and exposed. We advise a reasonable level of fitness as we will be walking, sometimes for long periods, up hills and through rugged terrain to access circles. We advise you carry local, Pounds Sterling currency, rather than Euros. We suggest you carry in your personal daypack or shoulder bag the following items: A reusable water bottle (full of water), lunch box (with goodies), sunscreen, sunhat, waterproofs, warm lightweight jacket or vest, insect repellant, camera, small bright torch, fruit and nuts. Bring your bathers for the City of Bath excursion, the new spa is recommended.